Sustainable Leadership begins with oneself, with the "personal sustainability". An effective employee is a leader himself, capable of influence himself as well as influence others positively, maintains a constant level of high performance and being-in-the-flow (compare with the experience of flow from Mihaly Csikszentmihalyi, flow-experience , Wikipedia). Several leaders driving this self-management synergistically aware give us the desired high performance team. The BusinessTreeSystem© summarizes all the current topics of modern leadership in a comprehensive training of 7 levels. - 100% present in the morning with the Laughter Medicine! This 8 hours seminar integrates all of the 7 levels of leadership. 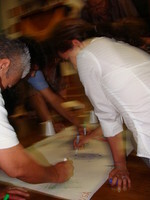 The participant learns to solve personal and team situations creatively. Each participant will receive the 7 keys and will learn to use them. My business performance about old paradigms. With a Tailored Solution, according to the customer and its situation, one of the 7 levels will be selected and topics will be adapted in terms of customer needs. Dosage: Basically choose between: motivational conferences, 3 hours duration (up to 999 people) or process seminars, 8 hours duration (up to 33 people, developing a personal action plan). Good leaders are like good actors, some just have it. What about the others? Can this be learned? Yes, it starts with recognizing that leadership and teamwork are human learning processes that begin with the care of your own body, emotions, mind and spirit. Only then we can respond to the current demands for Social Responsibility and the constant creation of new value for customers.